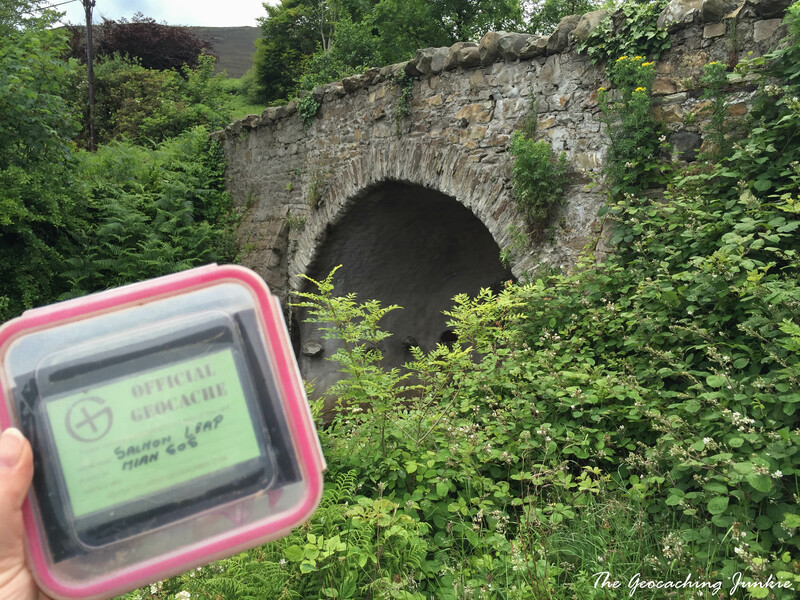 We may have only spent a short weekend in Donegal, but we most definitely found magic, adventure, history and beauty, and a few geocaches too! 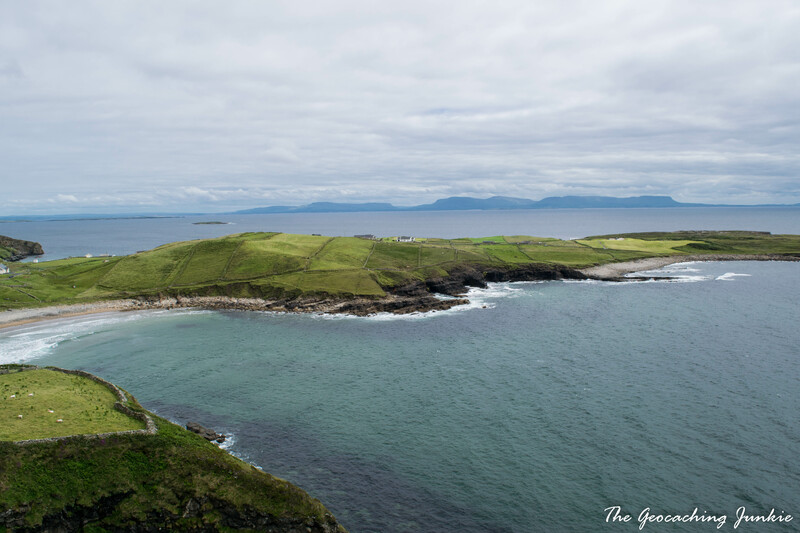 The Wild Atlantic Way is touted as, “the longest defined coastal route in the world,” and stretches 1,600 miles from West Cork in the South West all the way up to Malin Head, Donegal – the most northerly point on the whole island. 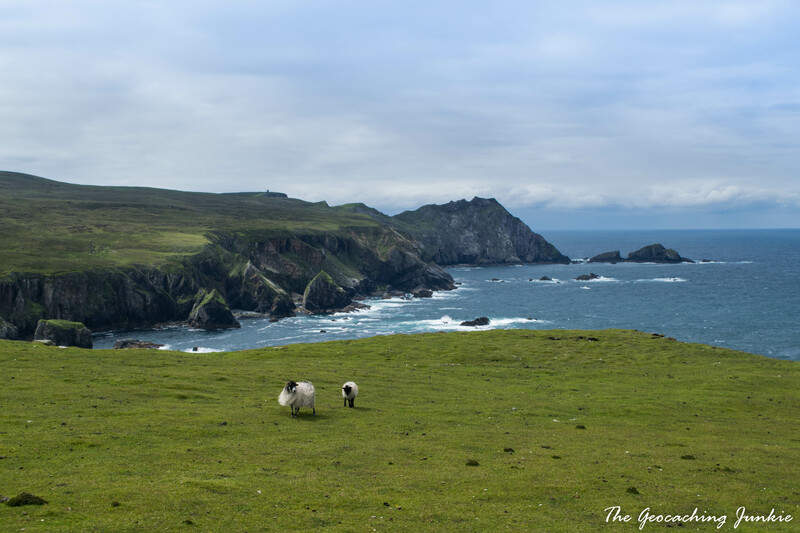 There is so much to see along the route and I have only done a small fraction of it in the past two years since it launched, visiting the Ring of Kerry and Skellig Michael in August 2014, Achill Island, County Mayo in August 2015 and West Clare last month. 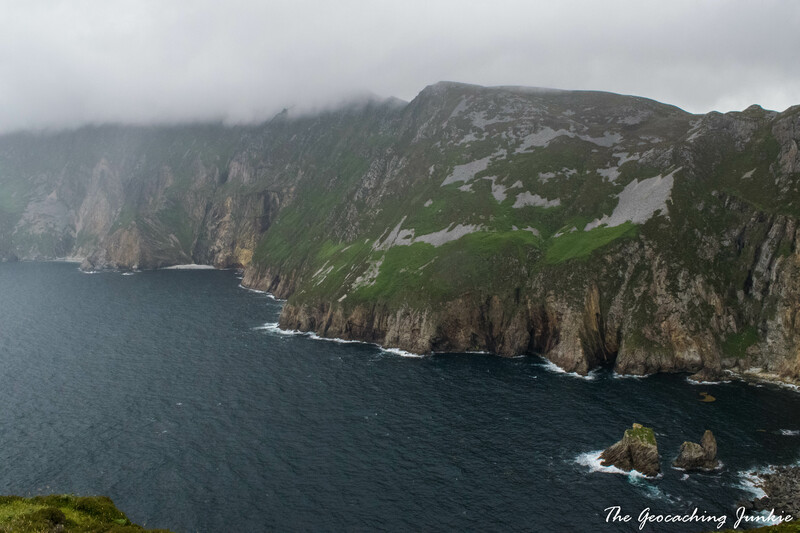 This month it was the turn of the Slieve League coast in County Donegal. Everytime I visit somewhere new on the west coast, I think, ‘this is my new favourite place.’ The reality is, I’ve loved every bit of it and I can easily see why people say west is best (though the east coast is not without its charms!). En route to our B&B in Glencolumbkille, we stopped off at Donegal Bay North, a cache I had DNF’d some two years previously. It seems the cache was missing on that occasion, but this time the only trouble I had was with curious muggles interested in some sort of staring contest, so it was a case of waiting them out. 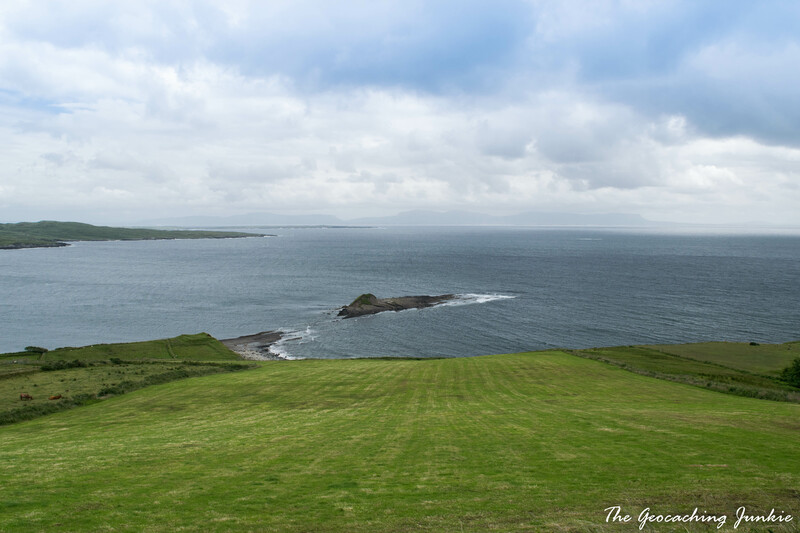 Luckily, the magnificent views across Donegal Bay were enough to keep us occupied until they left. 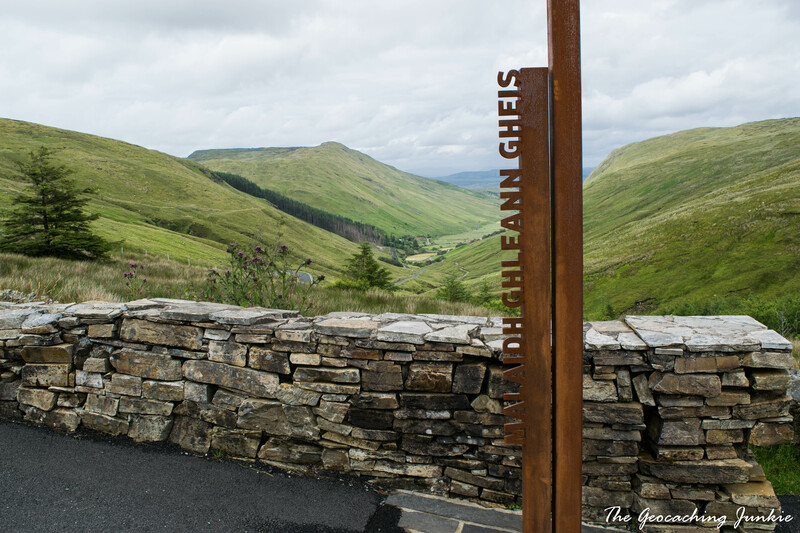 After checking in, we headed straight for Glengesh Valley. One of my favourite things in the world is a delightful view. Alongside geocaching, it’s the main reason why I go hiking, despite the fact I don’t generally enjoy the uphill element, to put it mildly. That ‘wow’ moment when you stand there speechless, amazed at the wonder of nature – I live for it! 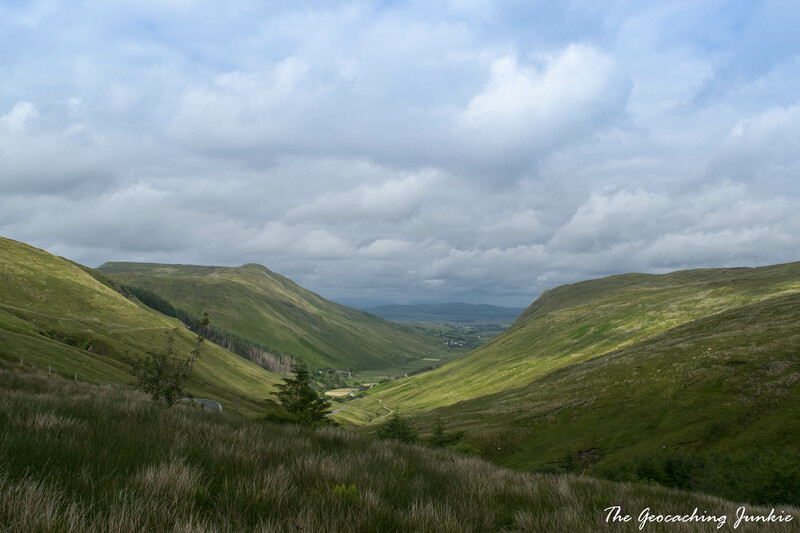 I equally love leading someone else to that view and witnessing their ‘wow’ moment, so I was delighted to take the muggle with me to the viewing point at Glengesh Valley. 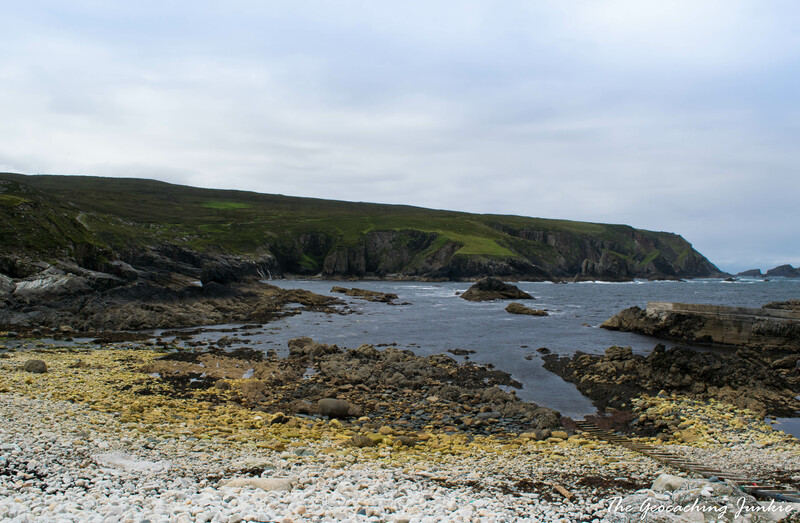 This is where I found my first ever EarthCache in March 2014, on my very first visit to Donegal. 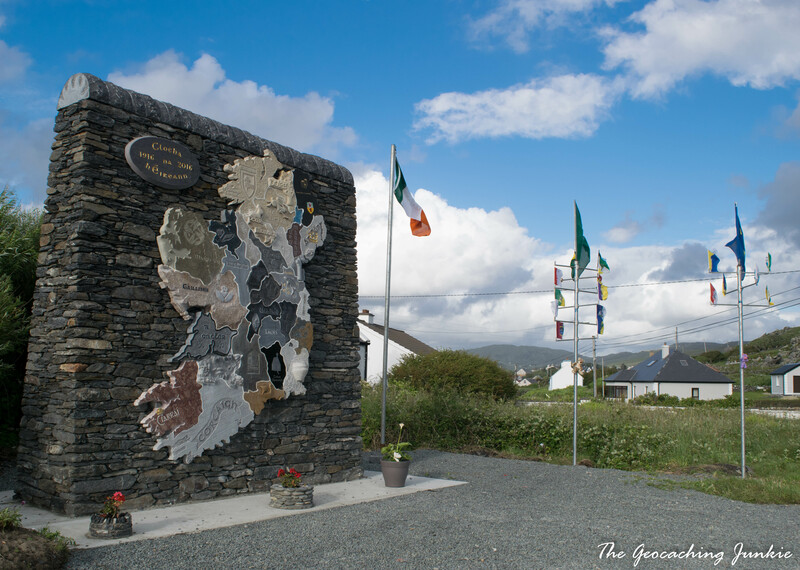 After a tasty dinner at An Cistin in Glencolumbkille, we headed just down the road to the car park for the Folk Village, where the 15 foot Clocha na hÉireann (Stones of Ireland) has stood proudly since the middle of June. The map consists of 32 stones native to their counties and carved by 32 different stone masons. Each stone is intricately carved and a unique work of art, and together, the map is truly awe-inspiring and a huge asset to the district. The locals we spoke to are fiercely proud of it and it’s easy to see why. 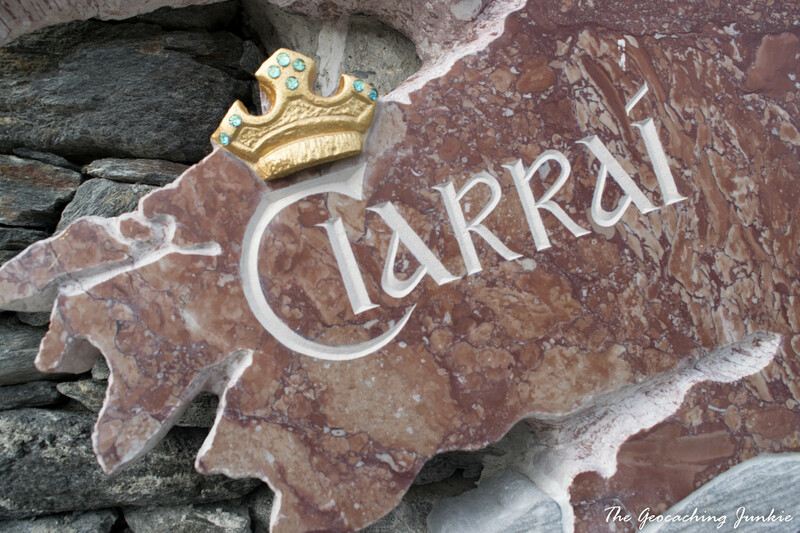 It was hard to pick a favourite but Kerry (Ciarraí) is an impressive piece of red marble featuring a beautiful gold crown, reflecting the county’s nickname of ‘the Kingdom’. 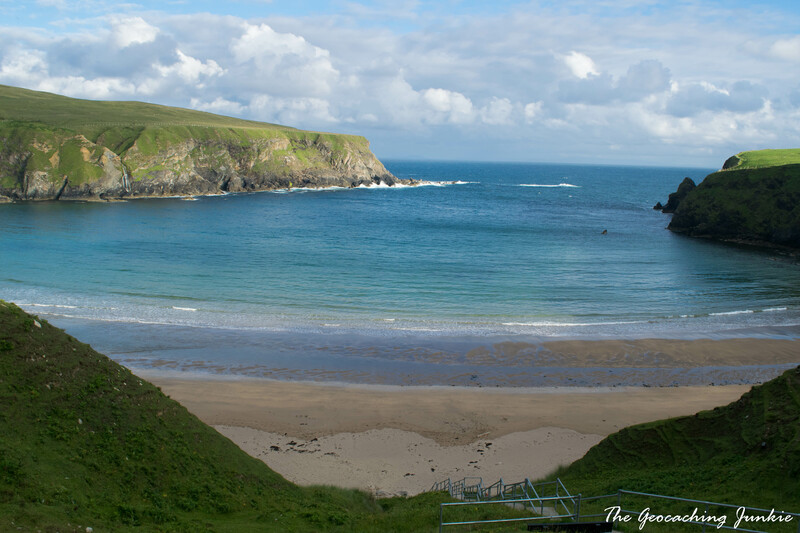 Our last stop of the evening was Silver Strand Beach at Malin Beg. The beach is accessed by a set of steeply sloping steps. From above, you can get a great view across the beautiful inlet with the highlight being a waterfall tumbling down the cliff face on the left. 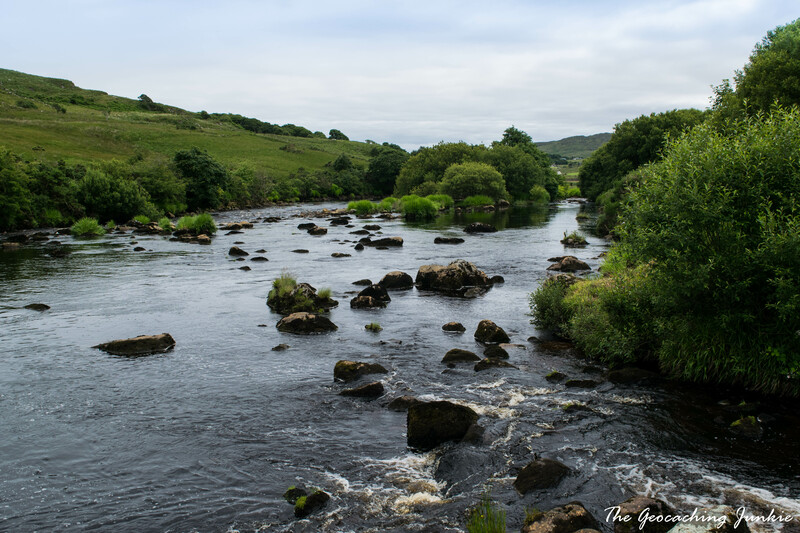 On Sunday morning, I wanted to revisit one of my favourite places in Ireland. An Port is situated at the end of a winding, narrow road and its remote location gives you the feeling of being at the end of the earth. 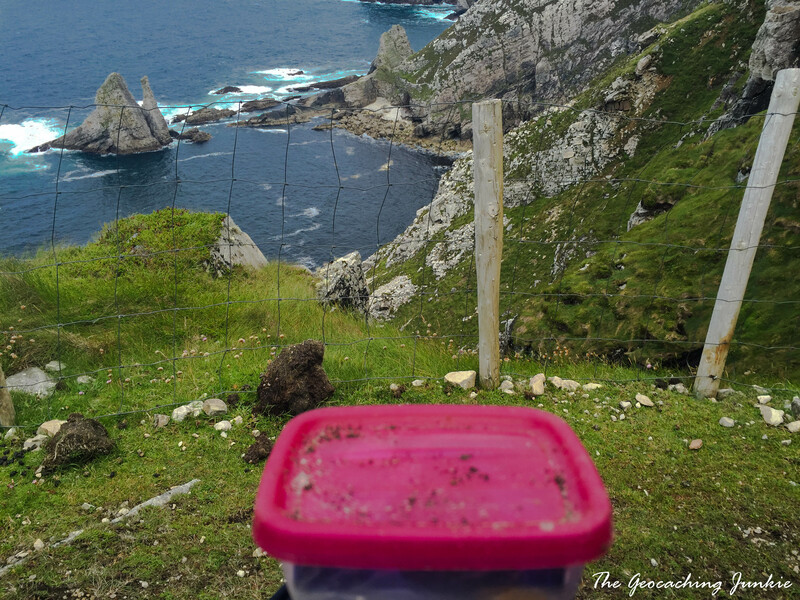 I had already found An Port (GC2H0BQ) in 2014, but I fancied doing one of the higher terrain caches surrounding Port along the coastline. The closest was An Bhuideal, a D1/T4 traditional. Starting at the shore, we got instructions from a friendly local who had been collecting his lobster pots. He advised us the best route upwards so off we set. It was steep and my calves burned with every step. It’s moments like that I think, “I better find this cache!” I took a few breaks to drink in the view and take some snaps. An Port looks even more breathtaking from above. 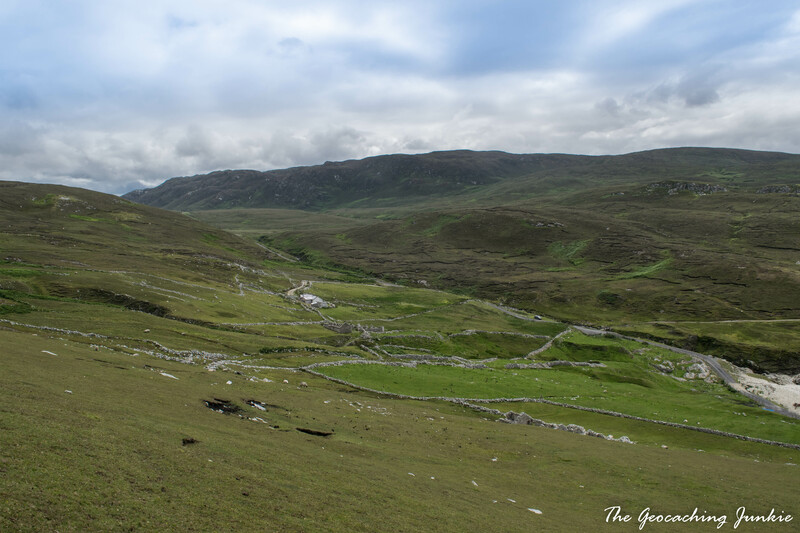 We continued uphill, beyond the lush grass with sheep grazing and through the heather until we were soon within 25 metres of GZ. I couldn’t see anywhere a cache could be hidden so read the hint. I went closer to the cliff edge and peered over. Sure enough, there was the hint item – down there. The muggle was dead against me going for the cache. In fact, he was surprised when I said I was going for it. My statement that I had done worse than this without him stunned him in to silence so off I went. The way down wasn’t just a slope, but rather like a series of steps made by nature. Steep steps, yes, but not just a tumble down a hill. I did have to sit down for most of it. It was exhilarating and it was awesome! I breathed a sigh of relief when I got to GZ and saw a geocachers’ pile of stones. There was the cache, nestled safely 364 days since last being found. This might just be the best view from GZ I’ve ever experienced. After a climb back up to firmer ground, I had a quick look at the next cache on the map but it was 1.2km away and I couldn’t convince the muggle to watch me hanging off a cliff edge again! 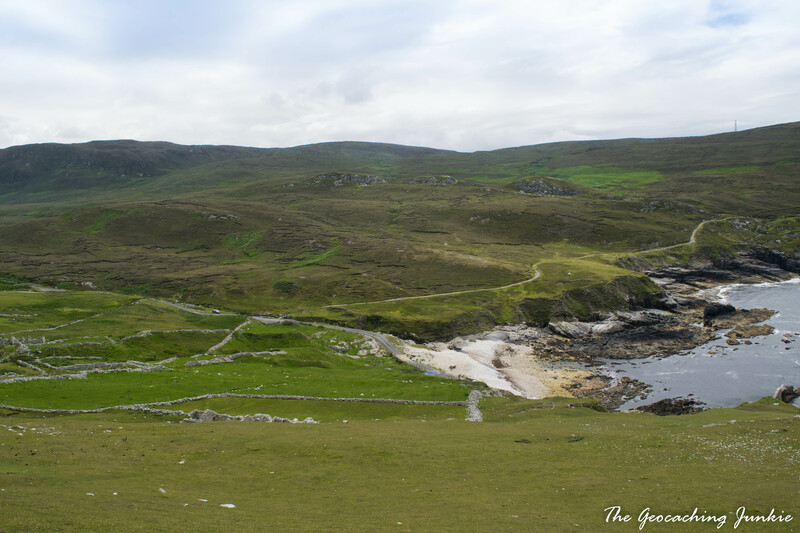 The way back down wasn’t as taxing as the way up and we took a look around the ghost village, most probably abandoned since the Great Famine (1845-1852) when the inhabitants either died or emigrated to America. 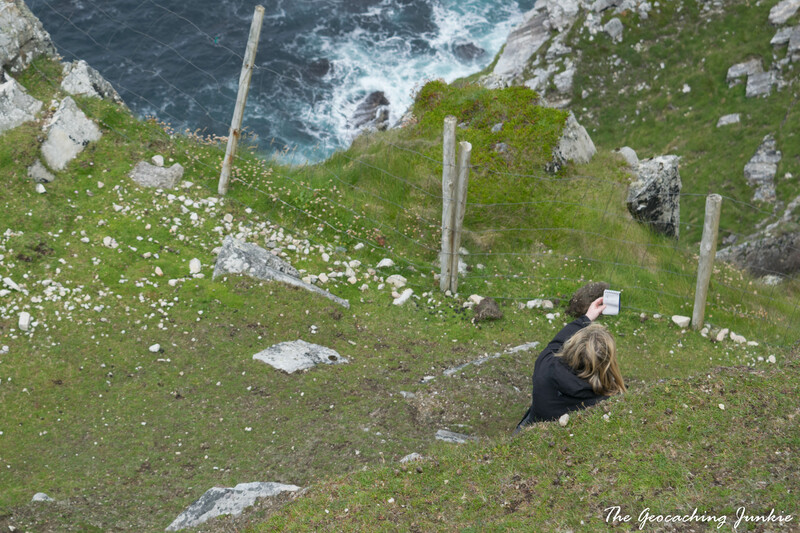 Our B&B host told us we must go to Slieve League Cliffs so we took her advice and headed there after An Port. I wasn’t sure we were on the correct route so stopped to ask a lady walking along the road. She gave us directions and advised us that we can drive all the way up and just to open and close the gate behind us. We arrived at a car park and were a bit dubious about her advice to open the gate and drive through so we parked. However, just as we started walking up the path, we met two cars coming down so we changed our minds and went a little further by car. Sure enough, you can drive all the way up, a fact that doesn’t seem to be widely publicised. Just as well too, as it started raining soon after we arrived at the cliffs and the road would have been a long one to walk, though many were doing it. 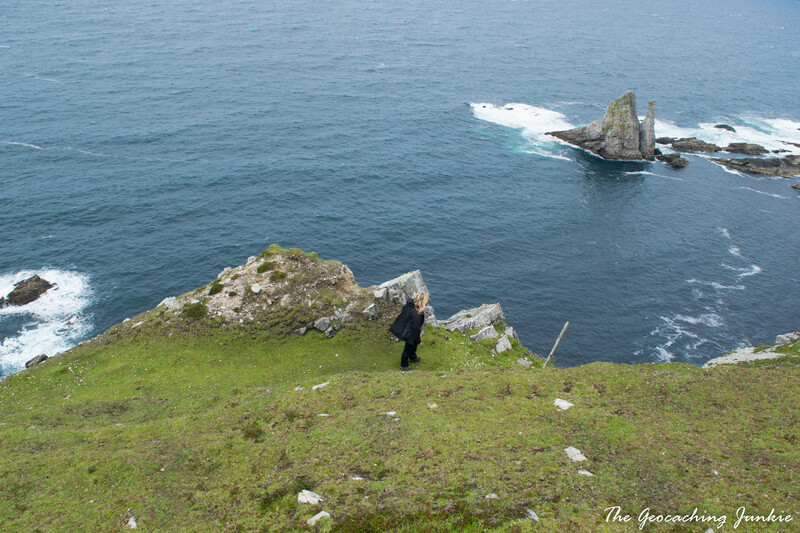 The cliffs were magical, with cloud hanging over the top, giving the illusion that they could have been much higher. 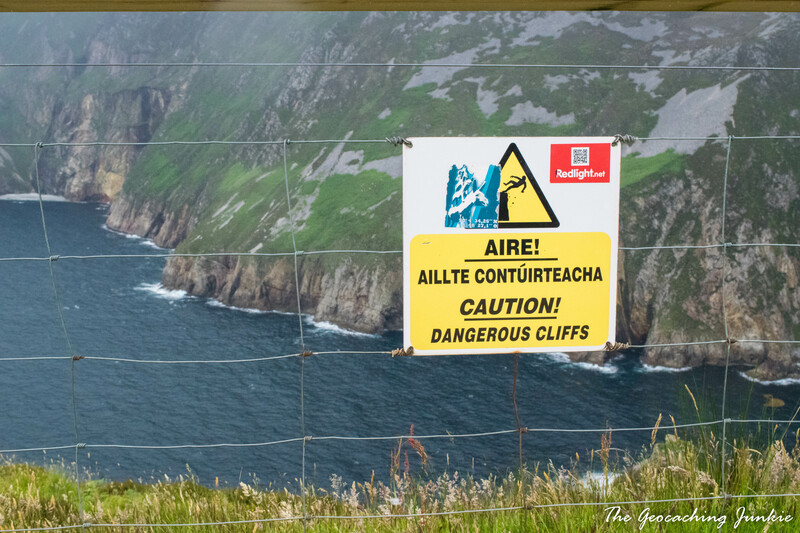 They are some of the highest sea cliffs in Europe. There was a cache a walk away but the rain put us off so we retreated to the car and stopped at two caches on the way home. Another DNF from my last visit. 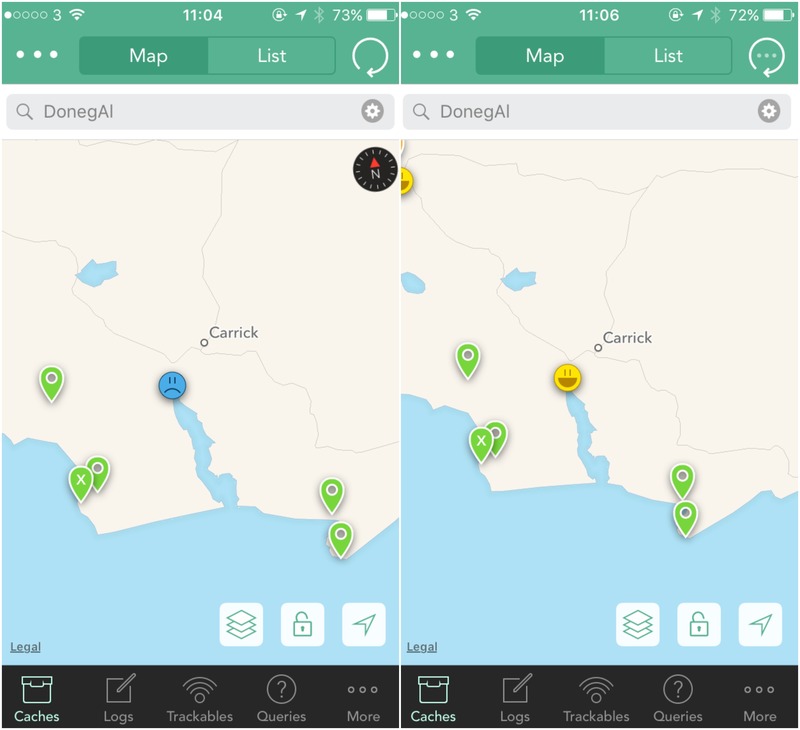 I didn’t recognise the location at all, but the Cachly app had a sad blue face to show my DNF – very cool new feature! Another cache at a fabulous spot, a great place to catch salmon as the cache name suggests. Two fishermen were packing up to leave as we arrived, so I could make the find in peace. I think that’s the first time I have avenged a DNF I don’t even remember! Our final cache of the weekend was at Muckros Head (Cionn Mhucrois), another fabulous golden beach with the waves of the Atlantic lapping the shore. The cache was a nice hide, though one I’ve seen before so I was able to instruct the muggle exactly where to retrieve it as there were two large spiders in residence just beside GZ! Only five caches found on our trip but five great ones: a real testament to quality over quantity! 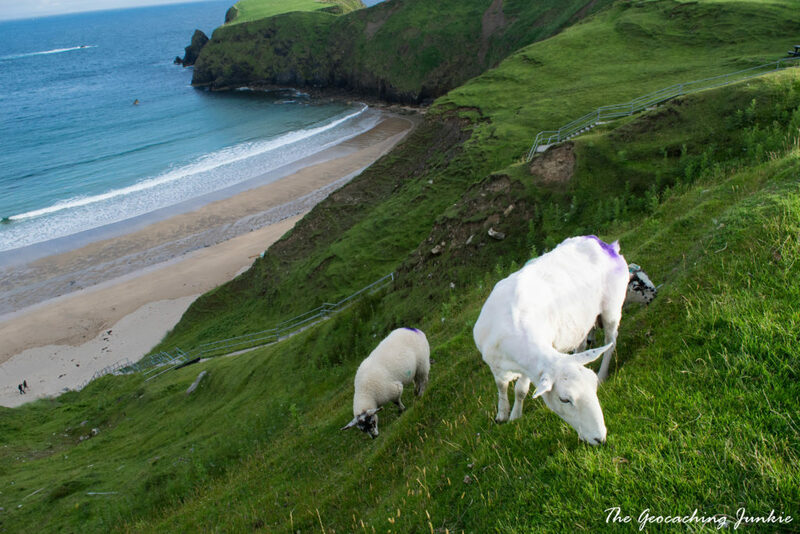 You’d be hard pressed to find a location on the Donegal coast that wasn’t stunning. There are many more walks and hikes to do and lots more caches to find so it won’t be my last visit! 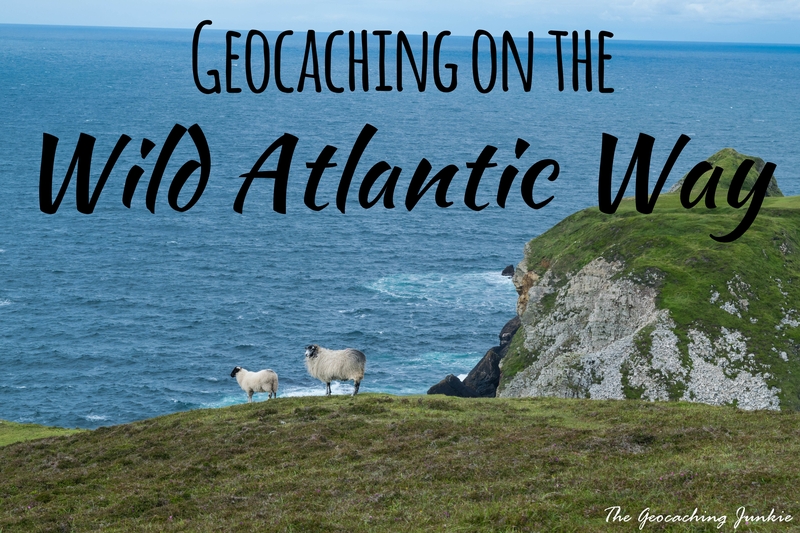 If you want to know more about the Wild Atlantic Way, visit their website here. You can find 188 ‘Discovery Points’ along the route, which are marked with discovery signs like the one below at Glengesh Valley (signs in the Gaeltacht, or Irish-speaking areas, are shown in Irish). Share your favourite cache with an amazing view in the comments! Thank you for yet again a wonderful blog.